Launch from Cape Canaveral (KSC); landing on Cape Canaveral (KSC), Runway 15. A first launch attempt on August 09, 2001 was scrubbed due to bad weather at the KSC in Florida. The main purpose of STS-105 (ISS-11-7A.1) was the rotation of the International Space Station crew and the delivery of supplies utilizing the Italian-built Multi-Purpose Logistics Module (MPLM) Leonardo on its second flight. Aboard Leonardo were six Resupply Stowage Racks, four Resupply Stowage Platforms, and two new scientific experiment racks for the station's U.S. laboratory Destiny. The two new science racks (EXPRESS Racks 4 and 5) added further science capability to the station. EXPRESS stands for Expedite the Processing of Experiments to the Space Station. EXPRESS Rack 4 weighs 533 kilograms (1,180 lb) and EXPRESS Rack 5 weighs 544 kilograms (1,200 lb). The empty weight of each EXPRESS rack is about 356 kilograms (780 lb). EXPRESS Racks 1 and 2A were delivered aboard the Raffaello cargo module during STS-100/6A in April 2001. 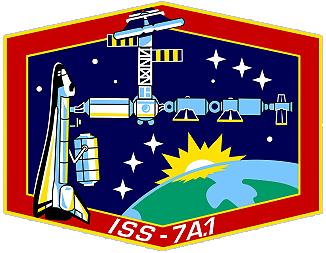 EXPRESS Rack 3 was brought to the station during STS-111 in 2002. The Resupply Stowage Racks and Resupply Stowage Platforms were filled with Cargo Transfer Bags that contain equipment and supplies for the station. The six Resuppply Stowage Racks contained almost 1,451 kilograms (3,200 lb) of cargo and the four Resupply Stowage Platforms contained about 544 kilograms (1,200 lb) of cargo, not including the weight of the Cargo Transfer Bags, the foam packing around the cargo or the straps and fences that held the bags in place. The total weight of cargo, racks and packing material aboard Leonardo was just over 4,990 kilograms (11,000 lb). Total cargo weight was about 3,073 kilograms (6,770 lb). Also carried in the payload bay was an Integrated Cargo Carrier (ICC) carrying the Early Ammonia Servicer and MISSE PECs 1 & 2. The Materials International Space Station Experiments (MISSE) was a NASA/Langley Research Center-managed cooperative endeavor to fly materials and other types of space exposure experiments on the space station. The objective was to develop early, low-cost, non-intrusive opportunities to conduct critical space exposure tests of space materials and components planned for use on future spacecraft. Johnson Space Center, Marshall Space Flight Center, Glenn Research Center, the Materials Laboratory at the Air Force Research Laboratory and Boeing Phantom Works were participants with Langley in the project. The MISSE experiments were the first externally mounted experiments conducted on the ISS. The experiments were in four Passive Experiment Containers (PECs) that were initially developed and used for an experiment on MIR in 1996 during the Shuttle-MIR Program. 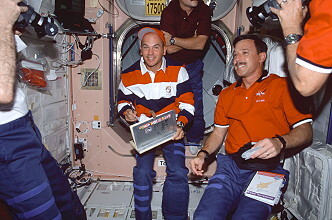 The PECs were transported to MIR on STS-76. 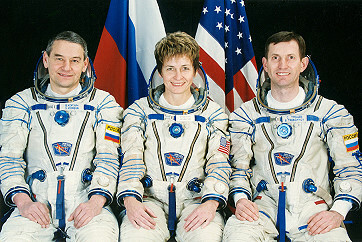 After an 18-month exposure in space, they were retrieved on STS-86. 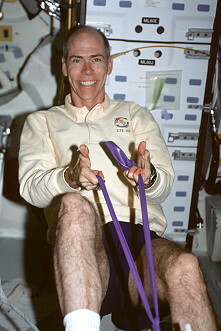 PECs are suitcase-like containers for transporting experiments via the space shuttle to and from an orbiting spacecraft. Once on orbit and clamped to the host spacecraft, the PECs are opened and serve as racks to expose experiments to the space environment. Discovery's crew spent its first full day in space checking out equipment that will be used for upcoming major activities - the shuttle's robotic arm; and the controls and tools used for the final rendezvous and docking with the station. The crew also powered up and prepared the shuttle's docking system and performed several engine firings to optimize the rate at which Discovery closed in on the station. 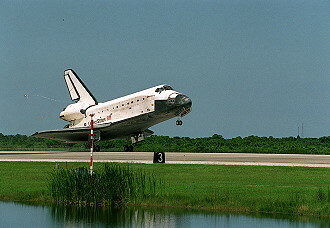 Discovery's rendezvous and docking with the International Space Station began with the precisely timed launch of the shuttle on a course for the station. During the first two days of the mission, periodic engine firings gradually brought Discovery to the starting point for a final approach. About 2 ½ hours before the scheduled docking on Flight Day Three, Discovery reached that point about 50,000 feet (15,240 meters) - 9 ½ miles (24.6 km) - behind the ISS. There Discovery's jets were fired in a Terminal Intercept (TI) burn to begin the final phase of the rendezvous. 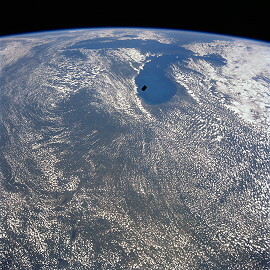 Discovery closed the final miles to the station during the next orbit of the Earth. As Discovery closed in, the shuttle's rendezvous radar system began tracking the station and providing range and closing rate information to the crew. During the approach, the shuttle made as many as four, small course corrections at regular intervals. Just after the last correction was completed, Discovery reached a point about half a mile (900 meters) below the station. At that time, about an hour before the scheduled docking, Commander Scott Horowitz took manual control of Discovery. 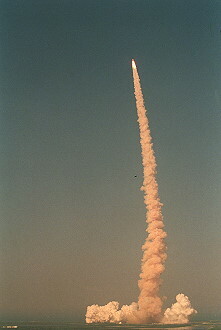 Scott Horowitz slowed Discovery's approach and flew to a point about 600 feet (182.9 meters) directly below the station. There he began a quarter-circle of the station, slowly moving to a position in front of the complex, in line with its direction of travel. During the rendezvous, Scott Horowitz was assisted by Pilot Frederick Sturckow. Mission Specialists Daniel Barry and Patrick Forrester also played key roles in the rendezvous, with Daniel Barry operating a handheld laser-ranging device and a laptop computer navigation aid assisted by Patrick Forrester. Daniel Barry also operated the shuttle's docking mechanism to latch the station and Discovery together after the two spacecraft made contact. Scott Horowitz slowly closed on the station moving at a speed of about a tenth of a mile per hour (0.16 kilometers per hour). Using a view from a camera mounted in the center of Discovery's docking mechanism as a key alignment aid, Scott Horowitz precisely centered the docking ports of the two spacecraft. Scott Horowitz flew to a point where the docking mechanisms was 30 feet (9.14 meters) apart, and paused for about five minutes to check the alignment. 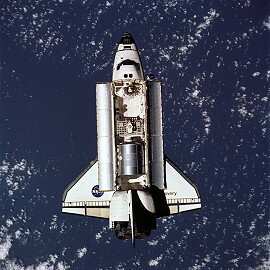 For Discovery's docking on August 12, 2001, Scott Horowitz maintained the shuttle's speed relative to the station at about one-tenth of a foot per second (3 centimeters per second), and kept the docking mechanisms aligned to within three inches (7.6 centimeters) of one another. When Discovery made contact with the station, preliminary latches automatically attached the two spacecraft together. Immediately after Discovery docked, the shuttle's steering jets were deactivated to reduce the forces acting at the docking interface. Shock absorber-type springs in the docking mechanism dampened any relative motion between the shuttle and the station. Once relative motion between the spacecraft had stopped, Daniel Barry secured the docking mechanism, sending commands for Discovery's mechanism to retract and close a final set of latches between the shuttle and station. 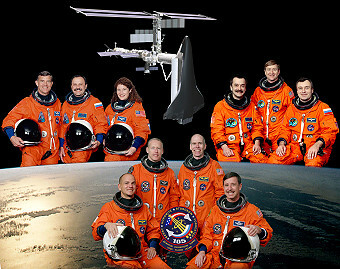 Frank Culbertson, Vladimir Dezhurov and Mikhail Tyurin became as third expedition the new resident crew of the ISS. 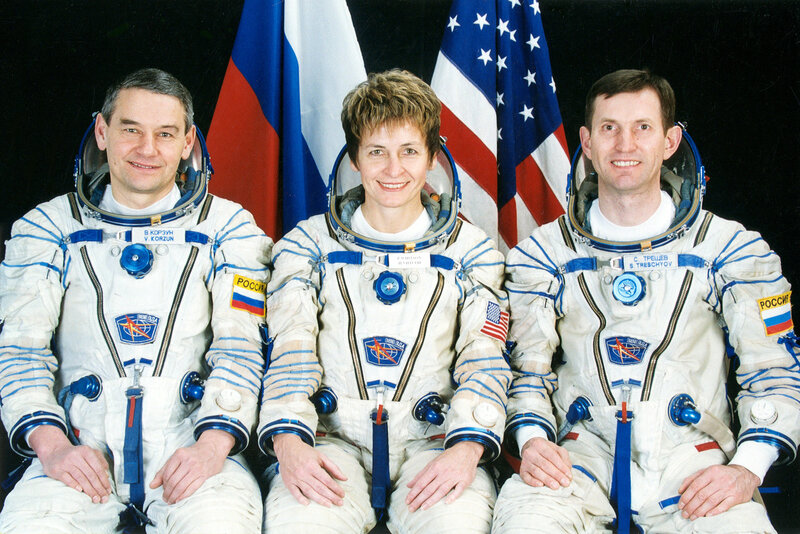 The second expedition with James Voss, Susan Helms and Yuri Usachyov returned to Earth with STS-105. Space station crew transfer is a carefully thought out process. As a member of the Expedition Three crew transferred from the shuttle to the ISS, that crewmember's custom-designed seat liner, called an Individual Equipment Liner Kit, was installed in the Soyuz spacecraft docked to the station. The seat liner of the replaced crewmember was removed from the Soyuz, and that individual then became a member of the shuttle crew. All three Expedition Three crewmembers completed the liner changeout with members of the Expedition Two crew on Discovery's Flight Day Four, though the formal beginning of Expedition Three occurred at final closing of the hatches between Discovery and the space station. Leonardo was lifted out of Discovery's payload bay on flight day four and attached directly to the station's Unity node for the unloading of its cargo. Once Leonardo was attached to Unity, half a dozen power, data and fluid connecters were hooked up. 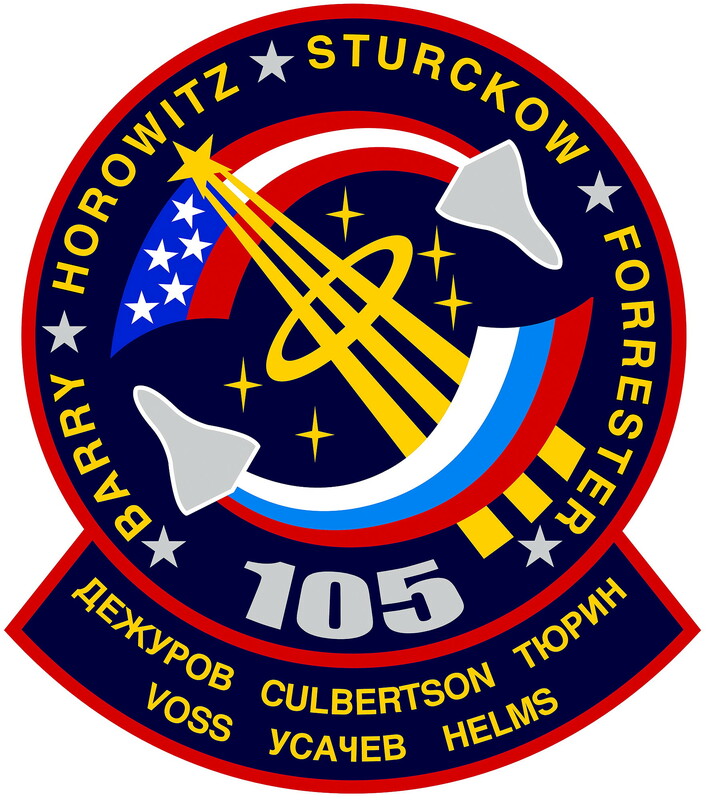 The following day the ISS crew began transferring equipment and supplies to the station. At the end of the common flight Leonardo was unberthed from the space station and, loaded with unneeded equipment and trash from the station, returned to Discovery's cargo bay. The first EVA was performed by Daniel Barry and Patrick Forrester on August 16, 2001 (6h 16m) to attach an ammonia servicing unit and two science experiment packages. During the first spacewalk, Daniel Barry and Patrick Forrester also attached an experiment to the outside of the station's airlock that will collect information on how various materials weather the space environment. 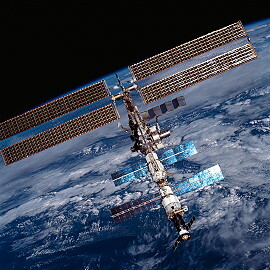 The experiment, called the Materials International Space Station Experiment (MISSE), was housed in two carriers that were attached to the station's exterior for an extended duration. As Daniel Barry and Patrick Forrester exited Discovery's airlock, Scott Horowitz maneuvered the shuttle's robotic arm into position to latch onto a grapple fixture on the EAS, bolted to a carrier in the shuttle's payload bay for launch. After Scott Horowitz had latched the arm onto the EAS, Daniel Barry and Patrick Forrester went to the pallet, called an Integrated Cargo Carrier, and began loosening the six bolts that held the unit in place. 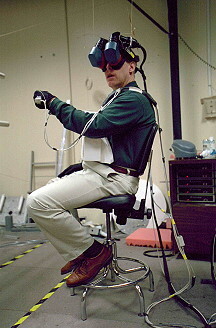 In addition, Daniel Barry translated hand-over-hand up to the station's Destiny Lab, where he picked up a foot platform to be used during installation of the EAS. With the bolts free, Scott Horowitz began lifting the EAS, with Daniel Barry and Patrick Forrester holding on to handrails on the EAS as well, up to the station. Scott Horowitz maneuvered the spacewalkers and EAS up to the position on the station's P6 truss where the EAS will be installed. There, Daniel Barry attached the foot platform and secured himself to it. Scott Horowitz released the arm's grip on the EAS, basically handing off the unit to Daniel Barry. Patrick Forrester then helped Daniel Barry align the unit over its attachment position and moved it to a "soft dock", where it was preliminarily held in place by a hook mechanism closed and locked with a pip pin inserted by Patrick Forrester. Patrick Forrester then tightened a bolt to firmly attach the EAS in position on the truss. The two spacewalkers then unfurled and attached cables to supply station electrical power to heaters on the EAS, completing the installation. That done, the spacewalkers held on to the station arm again as Scott Horowitz lowered them back to Discovery's payload bay, pausing at the station's Z1 truss to allow Daniel Barry to put the foot restraint in a stowed location needed for upcoming mission STS-110. In Discovery's cargo bay, Daniel Barry and Patrick Forrester moved to the carrier platform and released the two Passive Experiment Containers containing the MISSE investigations from their launch restraints. 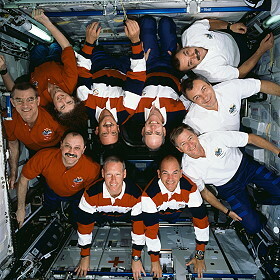 With each of the spacewalkers holding an experiment container, they held onto the arm while Scott Horowitz maneuvered them up to the station's airlock. There they let go of the arm and clamped the MISSE carriers to two separate airlock handrails. The second and final EVA by Daniel Barry and Patrick Forrester occurred on August 18, 2001 (5h 29m) to lay backup cables for future assembly. Scott Horowitz again operated the shuttle robotic arm to maneuver the spacewalkers, who were hanging on to the arm at times. As the spacewalk began, Daniel Barry and Patrick Forrester took with them from Discovery's airlock two bags containing the heater cables they installed on the station. 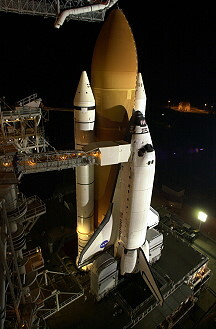 Called Launch to Activation heater cables, they were used on shuttle mission STS-110 to power heaters on the station's S0 truss segment, the center segment of the station's truss structure, more than 300 feet (91.4 meters) long. In addition, they took with them two bags holding 11 new handrails they installed on the Destiny Lab, called Orbit-Installed Handrails. Daniel Barry and Patrick Forrester held on to the shuttle arm, carrying the heater cable bags, as Scott Horowitz lifted them to the station's Destiny lab. There, they temporarily attached the bags to handrails, one on the port side of the lab and another on the starboard side. Daniel Barry installed six handrails on the lab's starboard side while Patrick Forrester installed five handrails on the port side. The spacewalkers also relocated two existing lab handrails. 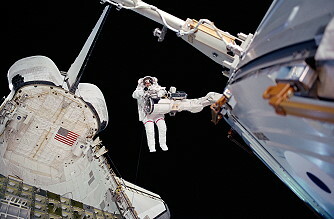 With the handrails installed, the spacewalkers then feed the heater cables along the rails on either side of the lab, connecting one end to the station and placing the other end in position for use when the S0 truss segment is delivered on STS-110. Other payloads onboard were part of the Goddard Space Flight Center's Wallops Flight Facility Shuttle Small Payloads Project. The SSPP system utilizes payload carrier systems such as the Hitchhiker, Getaway Specials and Space Experiment Modules to provide a low cost scientific research environment. SSPP payloads on STS-105 included the Hitchhiker payload Simplesat, The Cell Growth in Microgravity GAS Canister (G-708), the Microgravity Smoldering Combustion experiment (MSC), and the Hitchiker Experiment Advancing Technology Space Experiment Module-10 payload). Once Discovery was ready to undock, Daniel Barry sent a command that released the docking mechanism. 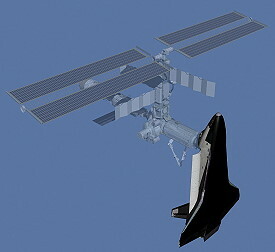 The initial separation of the spacecraft was performed by springs in the docking mechanism that gently pushed the shuttle away from the station. Discovery's steering jets were shut off to avoid any inadvertent firings during this initial separation. Once the docking mechanism's springs had pushed Discovery to a distance of about two feet (61 centimeters), when the docking devices were clear of one another, Frederick Sturckow turned the steering jets back on and fired them to begin very slowly moving away. From the aft flight deck, Frederick Sturckow manually controlled Discovery within a tight corridor as he separated from the ISS, essentially the reverse of the task performed by Scott Horowitz when Discovery docked. Discovery continued away to a distance of about 450 feet (137.2 meters), where Frederick Sturckow began a close flyaround of the station, circling the complex 1 ¼ times. Frederick Sturckow passed directly above the station, then behind, then underneath, then in front and then reached a point directly above it for a second time. At that point, passing above the station for a second time, Frederick Sturckow fired Discovery's jets to separate from the area of the station. The landing was delayed one orbit due to rain showers in Florida. Frank Culbertson, Vladimir Dezhurov and Mikhail Tyurin landed on December 17, 2001, 17:55:10.884 UTC with STS-108 spacecraft.